City Transport Map Volumes 1 & 2 contains ten travel maps in total and offers a selection of detailed routes for trains, subways, trams and airport shuttles. 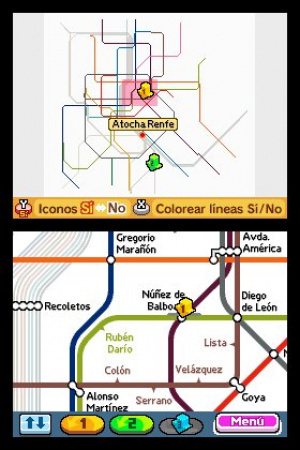 The maps vary in size depending on the city and different transport methods and specific lines can be highlighted via the touch screen and application menu. 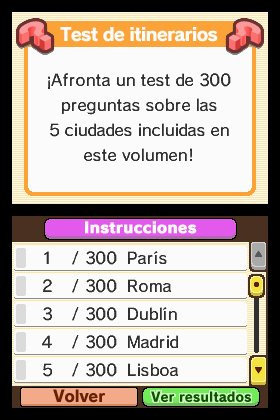 These DSiWare apps come in two separate downloads for 500 Nintendo points each, so be sure to pick the volume with the cities you intend to visit. 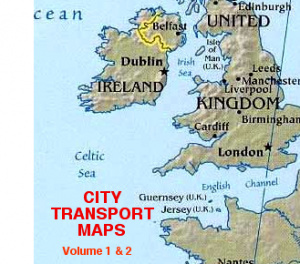 Volume 1 features maps of Paris, Rome, Dublin, Madrid and Lisbon while Volume 2 features London, Amsterdam, Prague, Moscow and Berlin. It should be noted that anyone expecting a guidebook or "areas of interest" type application will be sorely disappointed here: this application does exactly what the title suggests and very little else, which isn't necessarily a bad thing. Specific stations can be searched via a handwritten search as can specific lines, and entire transport systems can be highlighted via the "Transport Type Select" option, which offers an overview of available transport links throughout an entire city - who knew London had trams? Three coloured markers can be placed at any location on the map and these can be zoomed in on by simply clicking the corresponding coloured button: this can be used to work out which line to take to reach various locations, though it might have been helpful to have had more than three markers. The maps also contain details of current diversions and closed stations, though these details will be inaccurate in as little as a few months - a possible solution for this would be a downloadable update. Unfortunately due to a lack of any landmarks or well-known locations on the map it can be difficult, from the perspective of a tourist, to work out which station to go to, and indeed where each station is in terms of attractions. For instance, as the maps are quite complex it is perhaps quite difficult for someone who is unfamiliar with each city to work out exactly where they are on the map. As well as the maps themselves there are a few extra features such as handwritten memos that can be placed at any location on the map. The DSi's camera can even be used to take pictures of specific locations to create a travel log or collection of mementos though it should be noted that only 50 memos can be stored. This includes both photographic and handwritten memos and therefore this leaves on average only ten memos per location on each application. There is also a "Route Quiz" which tests the user's knowledge of getting to and from different stations, and while this is little more than a distraction it's a decent little extra, and photographs and trivia about each location are offered on occasion as rewards for correct solutions. However, it would have been nice if each correct answer had granted a reward. It is debatable as to just how useful a tourist would find these applications. Sure enough the maps are of good quality, but due to the lack of anything apart from transport lines and stations it’s quite hard to discern exactly which station is best for different visitor attractions. A tourist looking at a map of the London Underground is unlikely to have any idea where to go based on these maps, and another form of information would be needed to fill in the gaps, whether a guidebook or another application. For commuters on the other hand or individuals at least semi-familiar with each location these maps may hold some use, as they are thorough and detailed transport maps with just enough extras to warrant a download as opposed to just buying a paper version. Whether or not you buy this really depends on your need for the application; it’s perhaps not the most useful tool for people completely new to each city, and there are better applications out there on other systems. City Transport Map Volumes 1 & 2 are two DSiWare apps which are presented in a clean-cut and reasonably concise manner: it’s just a pity that the actual usefulness of the applications is questionable. If I could only get one volume of maps, which should I get; the first or the second? I wonder if this will be released in America with American locations. LOL, looks like this can stay in Europe. I hope they have a Canadian edition... And these apps will be pretty silly if they don't update them from time to time. Probably. Maybe as one with North American locations and another with Central/South American ones. Ask yourself which of the cities you want to visit. The shop page lists them. Ummm Yeah, Dont know really what to say about these because I have a TomTom and this looks pretty cheaply made. Without a GPS function this is throwing away money. But Im sure it will still outsell MFC. Unless they have a Carmen Sandiego included in them, I don't see how they are worth 500 points. @Hardy: I can't wait for the Canadian versions also! Would be very helpful. Great review! It's a tad disappointing they're not as useful as I had hoped but I'm sure its relative to the individual and obviously, the circumstances. Nice touch that Nintendo added with the Route Map. I do wonder if they'll release the same European maps to other regions, you know, for tourists. Though Adam said this isn't that great for tourists. One question though, does it update? This would be completely useless if it didn't. However, at 500 points it's cheaper than a map you'd buy from a Newsagency, and you get heaps of maps in one pack. Any shot that they try harder for an American release? this actually seems really useful based on what the review says it does. 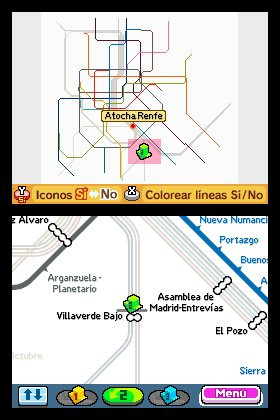 Strangely enough it actually is pretty hard to find transport maps of major cities that include the different types of lines WITHOUT too much other fluff, (i.e. portable) but covering large areas; and all for 5 bucks. A good subway map for a couple major american cities for 5 bucks will totally sell me if they release it here, and I wish I had it when I was in the Netherlands. half work...where are the other big cities of Europe? I see myself making great use of these. Seriously. Downloading both, as I travel to these cities often. @Darknyht, love your avatar. Hotel Dusk and Another Code own. I'll pass on the map apps, as I'm a gamer, not a cartographer. @Geo1AR: "500 pts? 200 at the most"
Maps are generally about this expensive. It's a fair price. 5/10 seems a bit low - sure the applications have their flaws, but they're still relatively useful for tourists going to these places. I'll pick them up if I need them. After downloading both map packs I have realised that these are great, useful applications for travel. considering public transportation is so varied in the U.S. and the U.S. systems are much much larger in scope and scale, we will not see this kind of thing released over here, are you people kidding? Useless, I got this thinking it would be like a handy portable google maps, not even close. It doesnt even list the street names, or how to get easily from one postal code to another. Go to the subway station and pick up one of the free folded up subway guides with the lines all highlighted different colours, and that will be 30 times quicker reference for getting from point a to point b.